What does compulsory pooling mean? 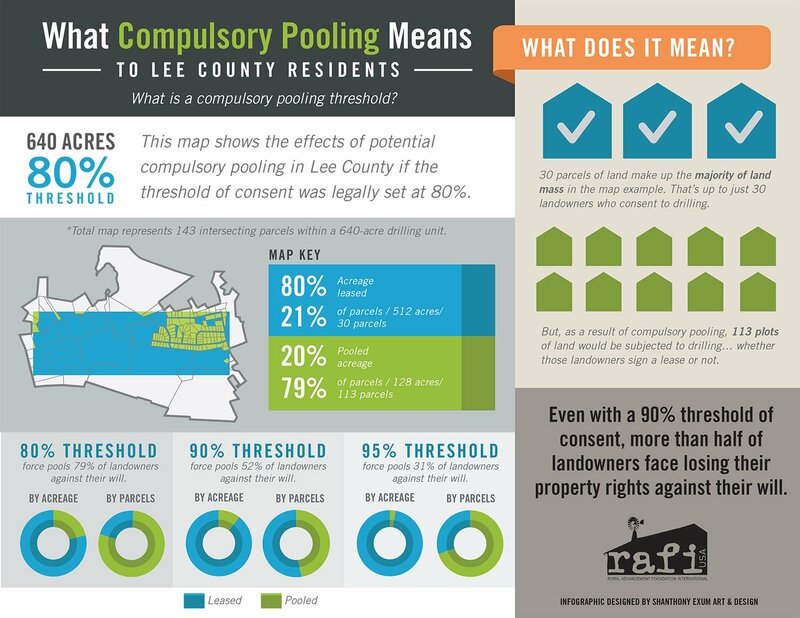 Home » The Farmstand: RAFI’s Blog » Landowner Rights & Fracking » UPDATED GRAPHIC: What does Compulsory Pooling mean? 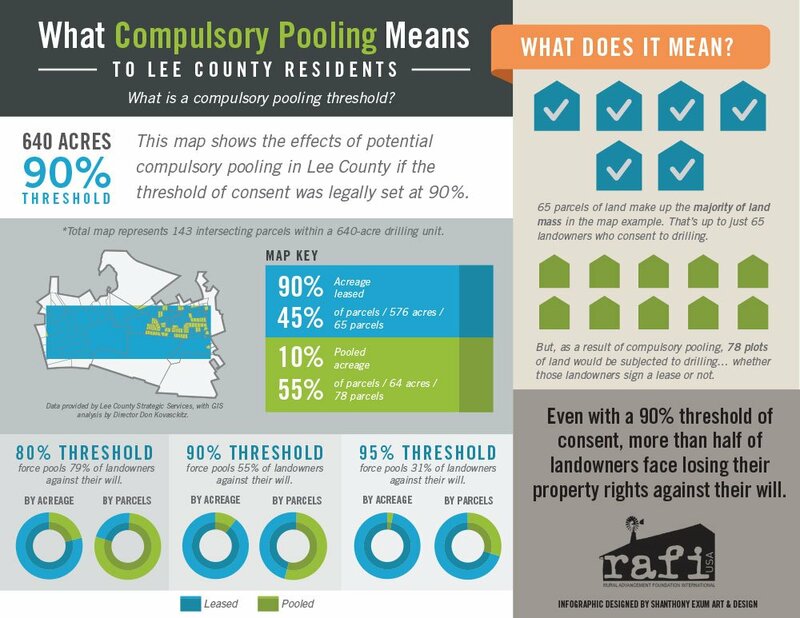 UPDATED GRAPHIC: What does Compulsory Pooling mean? UPDATE: As it stands, the Compulsory Pooling Study Group has recommended that 90% of the acres in a drilling unit be leased before other landowners can be forced to sell their gas. 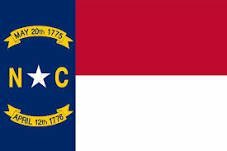 These recommendations will not be finalized until acted upon by the North Carolina General Assembly. We have updated our graph below to reflect the recommended 90% threshold. More than half of area landowners could be pooled against their will. ORIGINAL POST on Aug. 28, 2013: Compulsory pooling is used by oil and gas companies to force unleased or non-consenting landowners into oil and gas leases. It is used when oil and gas operators are unable, through voluntary agreement, to meet the acreage requirements for forming a drilling unit. Compulsory pooling can result in the loss of your property rights and allow oil and gas companies to force the leasing of your property. Below is a helpful infographic we created to explain compulsory pooling. As you can see, even with a 90% threshold of consent for drilling, more than half of area landowners could be pooled against their will. For more information, visit our Landowner Rights and Fracking Project page. To take action against compulsory pooling, click here. For questions, contact Scott Marlow at smarlow@rafiusa.org or (919) 542-1396, x210. 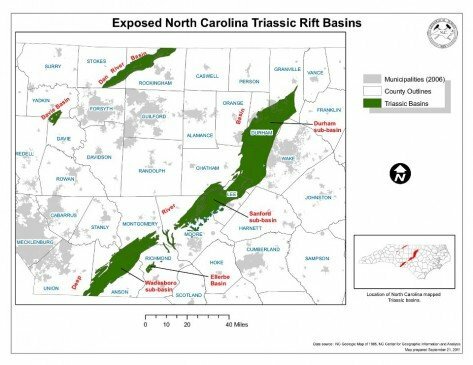 Once again, North Carolina legislators are trying to move North Carolina closer to fracking by pre-approving rules written by the Mining and Energy Commission. Take action now!